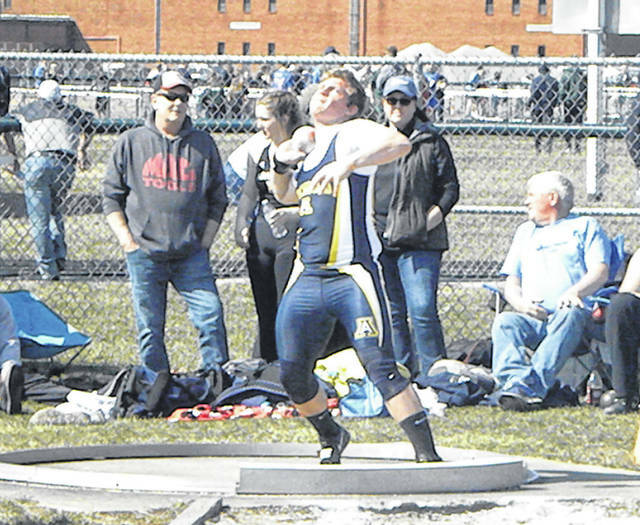 Archbold’s Josh Richer competes in the shot put at the Bob Eisenhart Invitational at Tinora Saturday. He finished third in the event, helping the Blue Streaks finish first in the team standings. 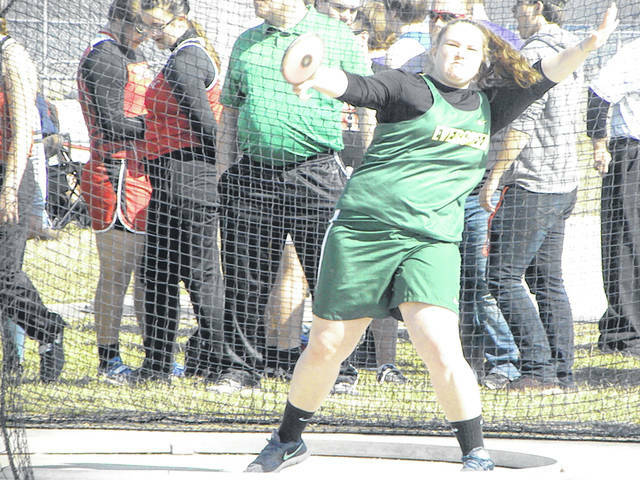 Jordan Lumbrezer of Evergreen tosses one in the girls discus. She placed sixth with a best throw of 97 feet, 3 inches. DEFIANCE – Local teams showed out on Saturday at the Bob Eisenhart Invitational. Archbold won both of the team titles. The Evergreen boys were second while Swanton was runner-up in the girls meet. Standing out for the Archbold boys was Tono Cruz who took home a title in the 300m hurdles. He was also runner-up in the 110m hurdles. The Blue Streaks also had runner-up finishes from Trey Theobald (200m, 400m), Caleb Ranzau (pole vault), Elijah Zimmerman (long jump) and Matthew Gladieux (discus). Archbold had winning relay teams in the 800 and 1600 meter relay. Reece Serna led the way for Evergreen with wins in the 100 and 200. Teammate Hunter Vanwert was runner-up in the 100. Both Serna and Vanwert were on the Vikings’ 400 relay that took first, a group that also included Anthony Sanders and Jack Etue. They also got a runner-up finish from Shane Ruetz in the 300 hurdles. Swanton’s boys won two events. Dylan Gilsdorf won the high jump and was on the victorious 3200 relay team that also included Brett Bettinger, Donovan Avalos and Blake Szalapski. Fayette garnered a title from Brett Merillat in the 800. He set a meet record with a time of 2:03.12. Delta had a nice showing in the field. Hunter Tresnan-Reighard won both the shot put and discus while Nate Kohlhofer was runner-up in shot put. Tresnan-Reighard’s throw of 152 feet, 6 inches in the discus set a meet record. In the girls meet, Archbold picked up titles from Dakota Stamm in the 200 and Gwynne Riley in the 800. In addition, Kylie Sauder was runner-up in the 800. The Streaks were also victorious in the 800, 1600 and 3200 relay events. Bobbie Oberle led the way for Swanton with wins in the 100 hurdles, where she set a meet record, and long jump. She also won the 400 relay along with Brooke Oberle, Jayden Hendricks, and Audrey Szalapski. Hannah Grabke won the pole vault with a meet record of nine feet. Asia Gensch won the 300 hurdles for Evergreen, who was eighth as a team. She was second in the 100 hurdles as well. Delta notched runner-up finishes from Cassandra Lee (300 hurdles) and Ella Ford (high jump). Archbold 124, Evergreen 67, Fairview 55.5, Montpelier 54, Patrick Henry, Tinora, Delta and Hicksville 45, Swanton 36, Ayersville 34.5, Wayne Trace 33, Fayette 32, North Central 31, Stryker 16. Archbold 98, Swanton 95, Hicksville 70.5, Patrick Henry 70, Ayersville 66, Tinora 59, Fairview 46, Evergreen 41, Wayne Trace 38.5, Delta 31, North Central 21, Stryker 19, Montpelier 7, Fayette 1.